A few decades ago, computers were a novelty. They were something that only corporations could afford or those with very deep pockets. Certainly, things have changed tremendously in the computer industry. Now, just about every household owns at least one computer. Small business owners to large corporations rely on their computers more than ever. Consequently, computers are an important part of everyday life. Certainly, there will come a time that the computer requires repair. People look to the professionals to provide information and quotes about their service. 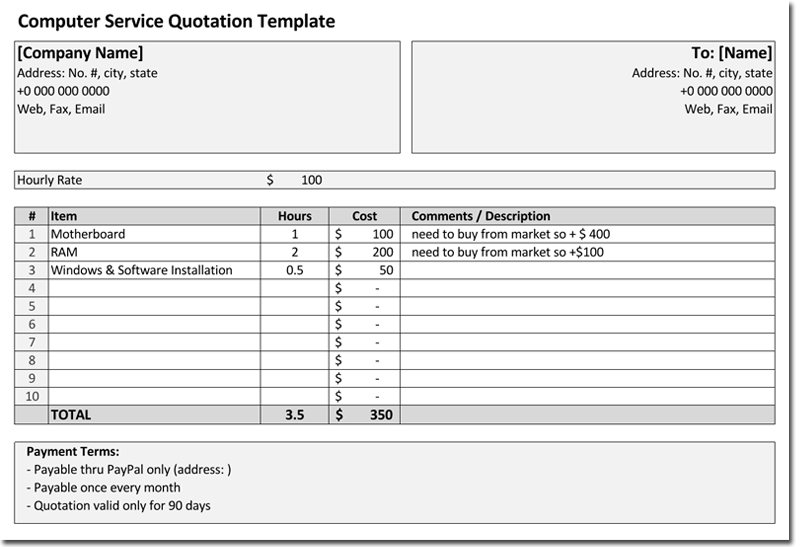 Professionals generally require a Computer Service Quotation Template in all their transactions to create documents to issue to their customers. Of course, a professional would prefer to submit a very professional looking document to their customer. The document actually says a lot about the company’s professionalism and the way that they handle customer contacts. A sloppy looking quotation document would certainly be out of line and give the company a very unprofessional look. 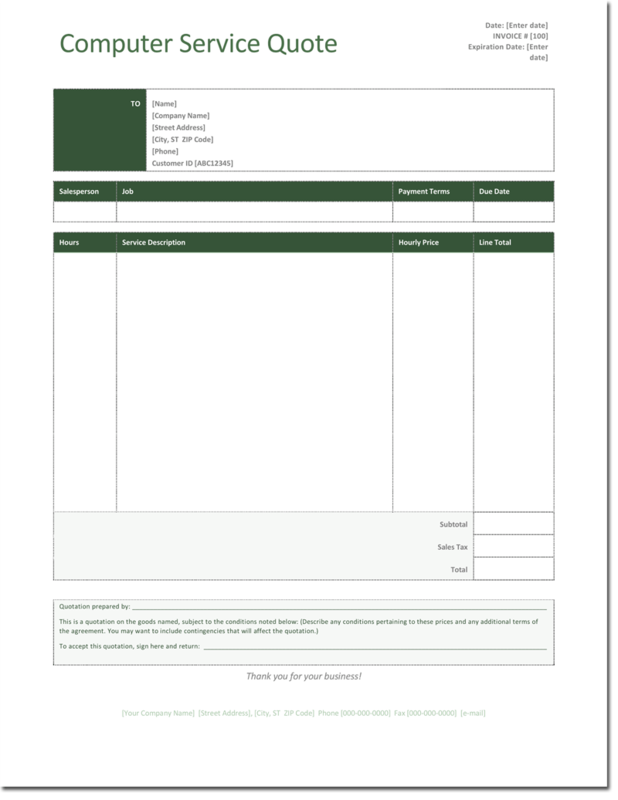 Some companies might simply write a price quotation on a slip of paper, while others take the time to write a general quotation on their company letterhead and deliver it to the customer. Of course, these are quick and easy options. The processional will draft a professional service quotation document that enables the customer to quickly scan the document and understand the information concerning the quote. The professional is able to take the copy of the document and scan it to their records for future use. The Computer Quotation Template here is easy to download. They are designed in Word and Excel. They are easy to edit and customize to fit your situation. Add company logo, change fonts, add notes, messages, and more. 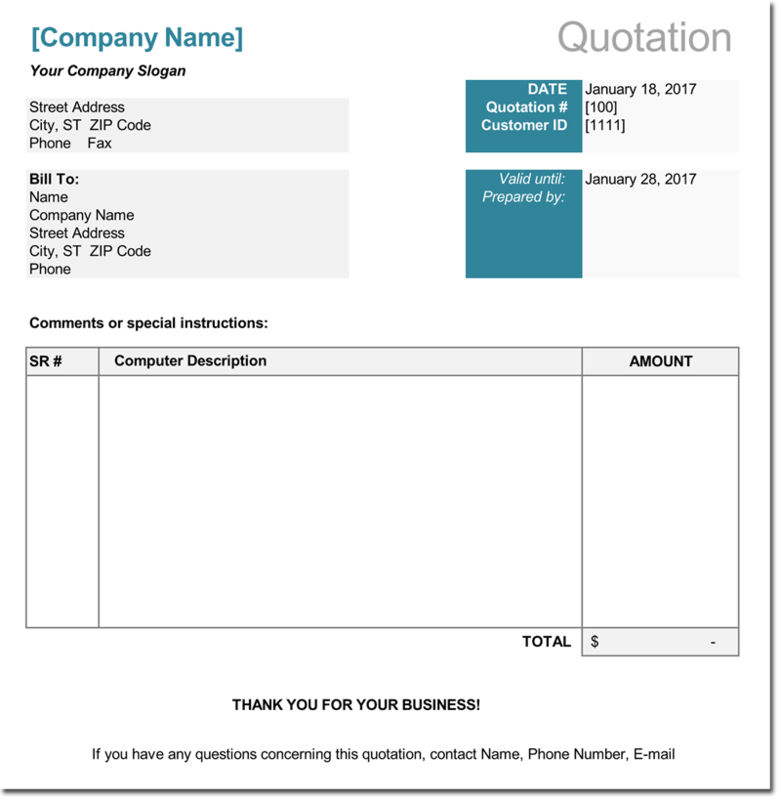 Don’t hesitate to download one or more of the included service quotation template(s) that will give all your documents a very professional and positive look.